One of the biggest advantages of DS18B20 is that multiple DS18B20 can coexist on the same 1-Wire bus. As each DS18B20 has a unique 64-bit serial code burned in at the factory, it’s easier to differentiate them from one another. The following tutorial demonstrates how to interface multiple DS18B20 on a single bus & get temperature readings from each of them. This feature can be a huge advantage when you want to control many DS18B20s distributed over a large area. 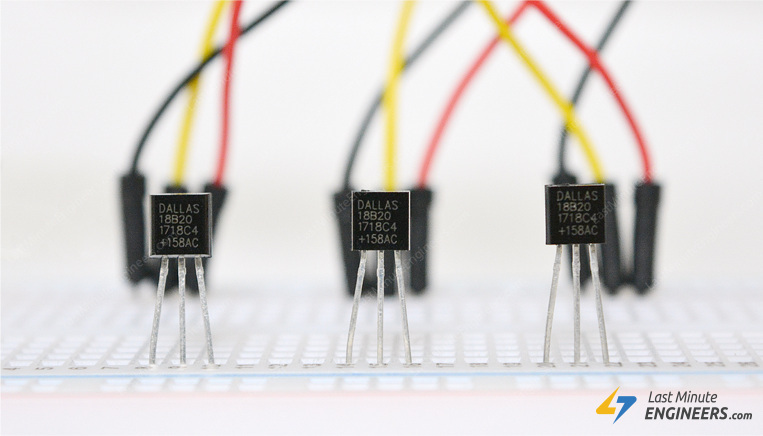 It may look intimidating, but you should be familiar with basics of DS18B20 one-wire temperature sensor, before venturing further into this tutorial. Consider reading through below tutorial first. 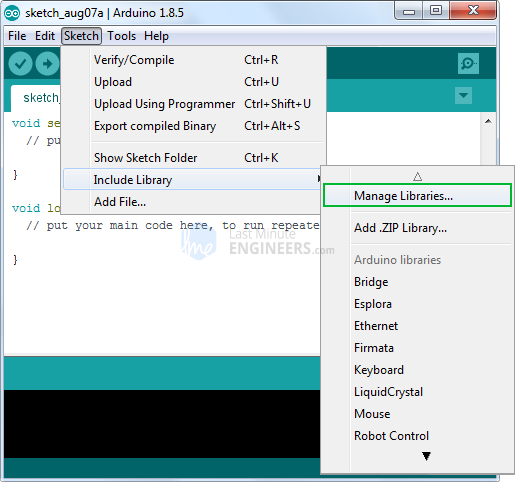 Without any further delay, let’s hook DS18B20s to our Arduino. Start by connecting all the DS18B20s in parallel i.e. common all the VDD pins, GND pins & signal pins. 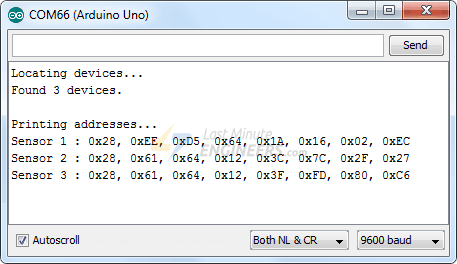 Then connect VDD to the 5V out on Arduino, GND to Arduino ground and connect signal pin to digital pin 2 on arduino. The Dallas 1-Wire protocol is somewhat complex, and requires a bunch of code to parse out the communication. To hide away this unnecessary complexity we will install DallasTemperature.h library so that we can issue simple commands to get temperature readings from the sensor. To install the library navigate to the Sketch > Include Library > Manage Libraries…Wait for Library Manager to download libraries index and update list of installed libraries. Filter your search by typing ‘ds18b20’. There should be a couple entries. Look for DallasTemperature by Miles Burton. Click on that entry, and then select Install. 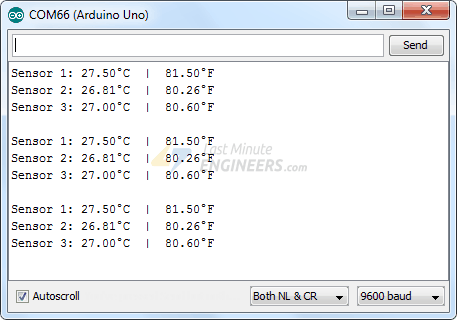 This Dallas Temperature library is a hardware-specific library which handles lower-level functions. 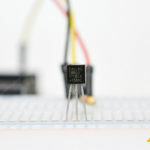 It needs to be paired with One Wire Library to communicate with any one-wire device not just DS18B20. Install this library as well. In this method, when the Dallas Temperature library is initialized, it detects all the sensors sharing the same bus. It treats the whole bus as an array of sensors and assigns them an index. So that we can pinpoint each sensor by its index and read temperature. The sketch starts by including libraries, declaring pin to which sensor bus is connected and creating object of DallasTemperature library. In setup part of code we first call begin() function. It initializes the bus and detects all the DS18B20s present on it. Each sensor is then assigned with an index and set bit resolution to 12-bit. Next we call getDeviceCount() function to get the number of devices found on the bus. In looping part of the code we use requestTemperatures() function to send command to all the sensors for temperature conversion. We know that each DS18B20 has a unique 64-bit address assigned to it to differentiate them from one another. In this method, we’ll find that address to label each sensor accordingly. The address can then be used to read each sensor individually. The following sketch detects all the DS18B20s present on the bus and prints their one-wire address on the serial monitor. You can wire just one sensor at a time to find its address (or successively add a new sensor) so that you’re able to identify each one by its address. Then, you can label each sensor. Copy all the addresses as we need them in out next sketch. The following sketch reads the temperature from DS18B20s by their addresses. Before you head for uploading the sketch, you need to change the addresses of DS18B20s with the one you’ve found in previous sketch. As usual the sketch starts by including libraries, declaring pin to which sensor bus is connected and creating object of DallasTemperature library. Next, we enter the addresses that are found previously for each temperature sensor. In our case, we have the following. In setup section, we initialize the library by calling begin() function and initialize serial communication with PC. 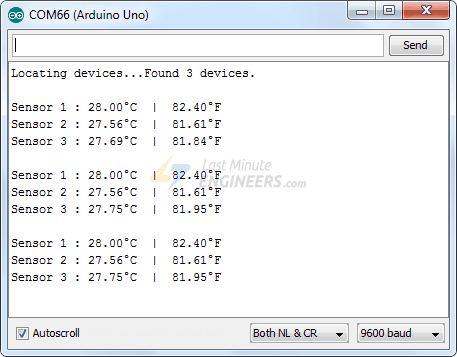 In loop section, we simply send command to all the sensors for temperature conversion using requestTemperatures() function. We then call printTemperature(DeviceAddress deviceAddress) custom function to print the temperature of the sensor whose deviceAddress is passed as parameter. The above function merely calls the library specific function getTempC(deviceAddress) to display temperature in Celsius and DallasTemperature::toFahrenheit() to display temperature in Fahrenheit.